The mission of the Lake Elsinore Valley Education Foundation, a component fund of The Community Foundation, is to provide scholarships to college bound LEUSD students. Providing books to elementary age students, is a program started in 2012. The Foundation was created in honor of former LEUSD Superintendent Dr. Sharron Lindsay, who envisioned it as a lasting way for the community to help support students of all abilities to pursue a college education. Fundraising activities for scholarships include an annual golf tournament in April and partnerships with local businesses. Left to Right: Kevin Pape, LEVEF Chairman; Ashlyn Dowell—Temescal Canyon HS; Vanessa Leyva—Lakeside HS; Beatriz Martinez-Martin—Temescal Canyon HS; Juliana Cuevas—Lakeside HS; Dayana Esquivel—Temescal Canyon HS; Jennifer Garcia Mendoza—Elsinore HS; Vanessa Ulrich—Elsinore HS; Maggie Brown—Elsinore HS; Fatima Espinoza—Lakeside HS; Daniel Ponce—Lakeside HS; Christa Unger—Lakeside HS; Elijah Cineas—Elsinore HS (not pictured). Each year the Lake Elsinore Valley Education Foundation provides scholarships to Lake Elsinore Unified School District High School graduating seniors interested in or intending to pursue post-high school course study at either a college/university or other post-secondary educational institution. school, junior college, four year college or university during the 2019-2020 academic year. 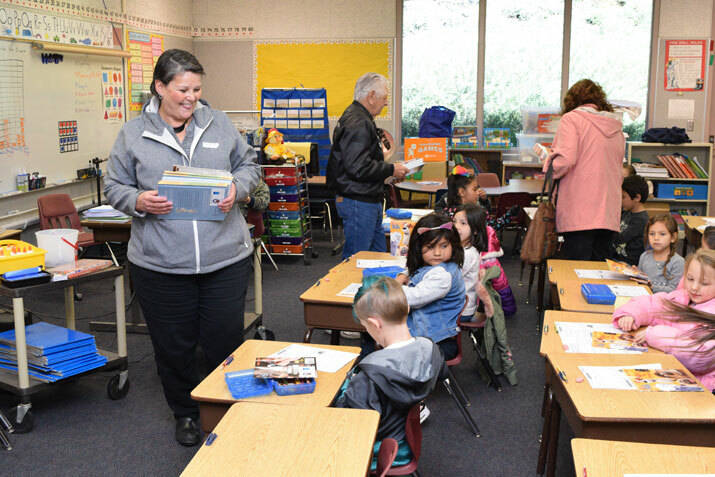 The Lake Elsinore Valley Education Foundation (LEVEF) and Wildomar Elks Lodge 2591 kicked off their annual First Book Program by giving brand new books to Withrow Elementary School students in grades TK to 3. This year’s distribution is extra special because of the emotional toll the Holy Fire has taken on students and families since the start of the 2018-19 school year. Withrow is one of the most heavily impacted schools in the Holy burn scar area, so students have had anything but a normal school year. To avoid the risk of mud and debris flow during inclement weather, Withrow Elementary must be closed each time mandatory evacuation orders are put into effect—a disruption and loss of 10 instructional days since the Holy Fire postponed the school start. According to LEVEF president Kevin Pape, “We chose Withrow to kick off our First Book Program to give students a needed lift. We were fortunate Dr. Judy White, Riverside County Office of Education Superintendent of Schools, could join us to see smiles first hand, accompanied by LEUSD Superintendent Dr. Doug Kimberly.” Over 500 free books were distributed in 20 classrooms on February 6th. 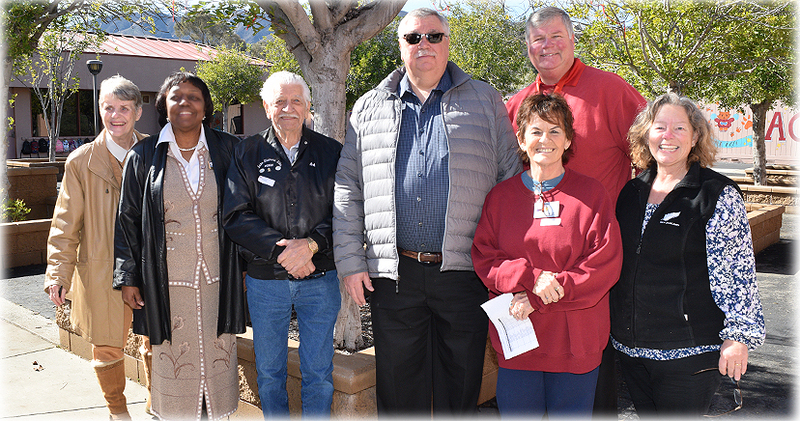 Dr. Judy White, second from left, poses with Dr. Kimberly and members of the Lake Elsinore Valley Education Foundation and the Elks Lodge 2591 during a book distribution to TK-3 students at Withrow ES. The First Book Program is one of two LEVEF endeavors to benefit LEUSD students; the second is providing annual scholarship awards to college/trade school bound seniors each spring. HOME RUN WITH PADRES BASEBALL! On July 10th at the Storm Stadium, the Lake Elsinore Valley Education Foundation will be honored as a 2018 recipient for a community donation from Padres and Storm Baseball. We received $1,500 that will be used to award scholarships to local LEUSD seniors. We appreciate the Storm Baseball organization and believe they really do care about their community and students; we thank them for their generous donation. The good news is that we gave away nearly 1,500 books at the Wildomar Trunk or Treat event in October 2018. The other good news is that we gave away 440 books to local Toy Drives for the Christmas Holiday season of giving. Between Cops For Kids and the Spark of Love toy drives we gifted 380 books. We also added books to the Toys For Tots bins for a total of holiday gifting of 440 great new books for kids in the communities of Lake Elsinore and Wildomar. Happy Holidays to all! We want to again celebrate our collaboration with the Elks Lodge in Wildomar. They generously donated monies and we were able to purchase 2,750 new books to give away this year! If we add up their donations since 2016 we have purchased over 5,000 books for kids in the LEUSD with their help. To date we have distributed over 15,000 books in the LEUSD since 2012 with partners like GMC Buick Lake Elsinore, Lake Elsinore Elks and Whitehorn Construction. If your business would like to sponsor books, contact Maureen Foster Davis. Set aside Saturday, April 20, 2019 for a great day of golf as we swing into another year of successful fundraising. Last year we raised $5,000 towards scholarships and this year our goal is to raise $9,000! We’ll include a great golf day starting off with a box lunch so you don’t hit the links hungry. Lots of team awards are up for grabs as well as a delicious after tournament dinner. We can register you to play by mail, online or via a phone call; we make it easy! For player registration and tournament information contact Tournament Organizer at [email protected] for player registration information. Our collaboration with Southern California Edison just gets better every year!, This year with $5,000 in scholarships we awarded five local seniors who plan educational pursuits in Science, Technology, Engineering and Math. Thanks to So Cal Edison for their generosity! If you’re looking for a great way to spend some dollars that have tax benefits, look no further than our Golf Tournament. Some levels of sponsorship include player registrations so it’s a win -win! Our sponsorship levels range from $100 to $3,000 so there’s a giving level for every budget. All monies raised through our sponsorship program will assist in awarding scholarships to local LEUSD students in 2019! Contact us and we’ll get back to you with sponsorship forms and information. Our goal is to raise $9,000 to be awarded to students from four local High Schools in the LEUSD. Your contribution will be the key to our success! Established in 2007, The Lake Elsinore Valley Education Foundation (LEVEF) was created in honor of former LEUSD Superintendent Dr. Sharron Lindsay, who envisioned it as a lasting way for the community to help support students of all abilities to pursue a college education. We are also proud of our new program that provides books to elementary age students. Our next big step starting in Fall of 2018/19 is supplemental funding for enrichment programs that will provide educational opportunities, including academic, artistic, vocational and athletic needs. The Lake Elsinore Valley Education Foundation is proudly affiliated with The Community Foundation. The mission of The Community Foundation is to enhance the quality of life in the communities it serves.